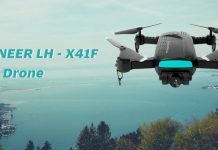 Home Drones by Price Drones from $51-100 Lefant Zeraxa Pro review: FlyAway & R.I.P. Lefant Zeraxa Pro review: FlyAway & R.I.P. Winter will come with lots of cool drone reviews on FirstQuadcopter. 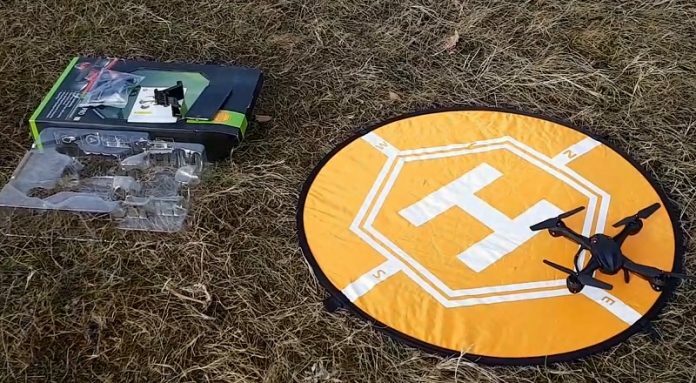 We are expecting this month at least 8 new drones till the end of the year. 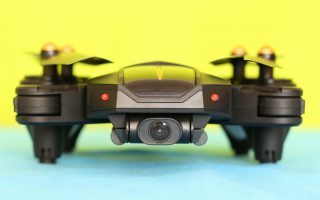 Few of them will be reviewed not just firstly, but also exclusively here, on your favorite drone blog. We will start with the Lefant Zeraxa Pro, a quite nice entry-level drone. Lefant is a relatively unknown RC brand. Their products can be found on eBay and Amazon. Currently, the Zeraxa Pro (66223) is their flag-ship model. It features all the usual stuff (alt-hold & headless mode), plus some cool extras. 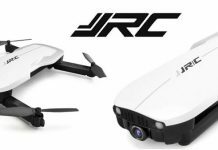 In addition to the frontal 720P WiFi FPV camera, it has a second camera facing the ground which serves as optical flow sensor. About 7~9 minutes playing time. Disclosure: I received this Zeraxa Pro quadcopter as part of a product review collaboration with Lefant. Although the drone was a gift, all opinions in this review remain my own and I was in no way influenced by the sponsor. The package arrived quick and smooth. I received the box at my door with a big Amazon seal on it, in just 10 days after we agreed on the review terms. Inside the stylish gift box I found, besides the drone and its remote controller, a pair of spare propellers, flight battery, USB charging cable, phone holder, sunshade, screwdriver and user manual. There is also included a “Thank you” card with Skype and e-mail contact details. Like its name, “Zeraxa”, the design is very futuristic. With those eye shaped transparent windows, it seems to be coming out from an 80s Sci-Fi movie. It has two bridge type landing gears and comes fully assembled and ready to fly. The aircraft measures about 19 × 19 × 6 cm and weights 110 grams. Here I should note, that an older model, called Hover-way Alpha, had similar design. The 1s/850mAh LiPo battery is loaded from the tail of the quadcopter. The battery bay is very large, could easily accept even a 1200mAh LI-PO. If you want to make a battery upgrade, you should look for one with JST connector. Anyway, in order to avoid flight performance degradation you should keep the take-off weight as low as possible. Power switch is located on the right side of the fuselage. On the belly of the Lefant Zeraxa Pro is the second camera which makes it special over other toy drones. This tiny optical flow sensor ensures super stable hovering which is needed for selfie videos. The micro SD card slot is located right under the battery bay door. The Zeraxa Pro is capable to record videos on-board without the need of a phone. During night flights, besides the two frontal red lights, you will be guided by another eight LEDs (two under each arm – white in front/green on rear). Like most of the toy drones, the Lefant 66223 also features multiple control modes. If you are an old fashioned guy, like me, you can stay with the physical transmitter, but if you want to try something new you will like the APP Control. The included transmitter is completely black and also has nice futuristic design. In the box there is a phone holder that can be easily attached to the RC’s antenna. The tiny sunshade offers better view on the phone screen during strong daylight. On front panel, besides the two control sticks (both center positioned), there are 5 control buttons. From left to right: Beeline, Circle. Headless, Photo and Video. No status screen, but at least all buttons are nicely labelled. Switching between flight speed rates (Low/High) can be done by short pressing the right control stick. The RC also has two shoulder buttons. Left one for take-off and right one for landing. The Zeraxa APP is available for free download on Goggle Play as well as on iTunes. 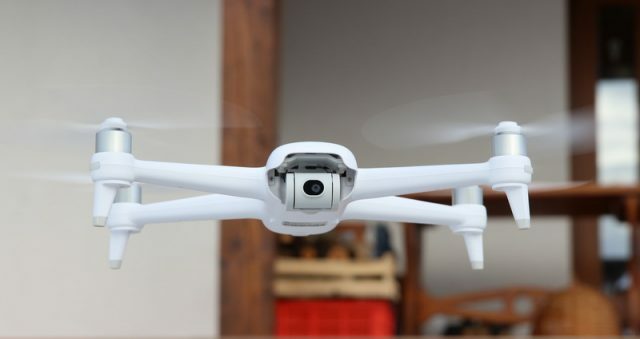 It can can be easily installed by scanning the QR code from the drone user manual. The main interface is very intuitive and offers all the functionalities of a standard remote. 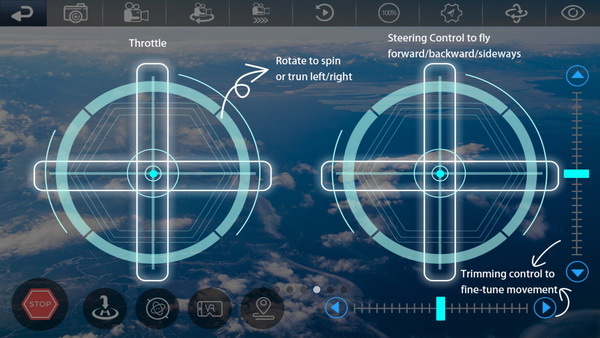 You have two ways to control the aircraft’s movements while using the APP : through virtual sticks or via mobile’s gravity sensor (by tilting the phone). 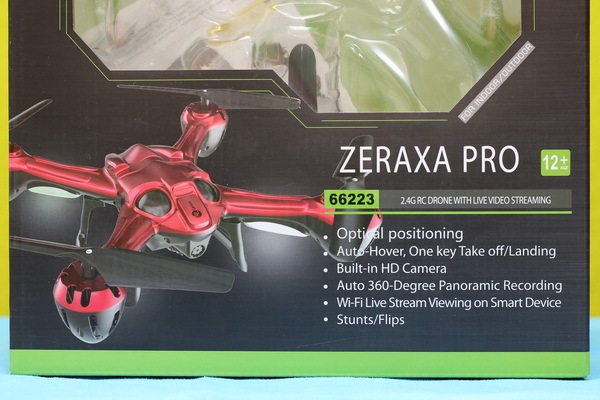 Similar to other toy drones, the Lefant Zeraxa also comes with HD camera. 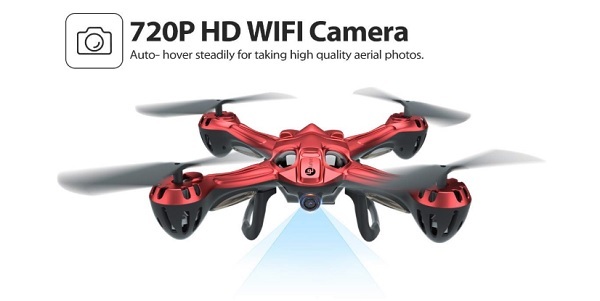 The on-board 720P camera features WiFi real-time image transmission (FPV). As I previously mentioned, the camera is capable to record locally on micro SD card or remotely from the WiFi real-time image feed. Anyway, for best results I suggest to use on-board recording which is not affected by drawbacks of WiFi transmission (lag & poor signal). Five minutes of recorded video occupies about 78 MB. During recording, the rear green LED will blink. Outdoor, in good light conditions, video quality is decent, but do not confuse it with a GoPro. Most drones under $100 won’t take videos that look half as good as the ones recorded with a similar priced phone. One of the most fun features is the FPV real-time video transmission. Kids will love to spy the neighbor’s dog. Of course, due to the short WIFI range and noticeable lag, it can be used to fly through VR headset. Giving throttle for the first time, I was pleasantly surprised how quite is this drone. 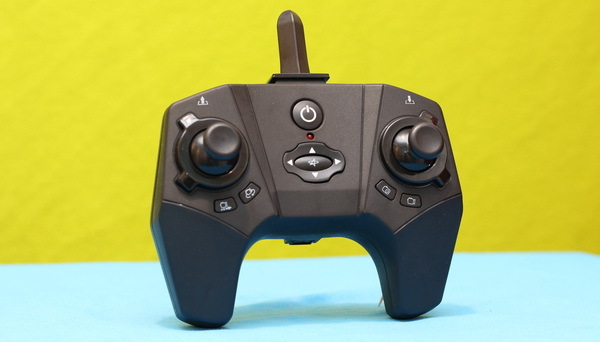 Pressing the left shoulder button, the Lefant Zeraxa Pro will rise about 1.5 meters over the ground and start to hover. It perfectly holds its position without touching any stick. The combination of the optical flow sensor and the barometric air-pressure sensor does a great job. The manual says that it has multiple speed rates. Frankly, I tried to toggle between them, but I haven’t noticed any difference. Anyway, its flight performance is just perfect for kids. As you can see in my test video, it does flips&rolls in all directions. I also tested the “Beeline” and “360°” recording modes, which are new features in its market segment. Note: Not to confuse the 360° recording mode with circle hovering. The drone is just rotating around its axis, you can’t set a radius. My first flight ended after about 9 minutes. With a higher capacity LIPO, flight time could be easily extended to 10-12 minutes or even more. Next day I went out to record some cool aerial videos next to a nearby forest. 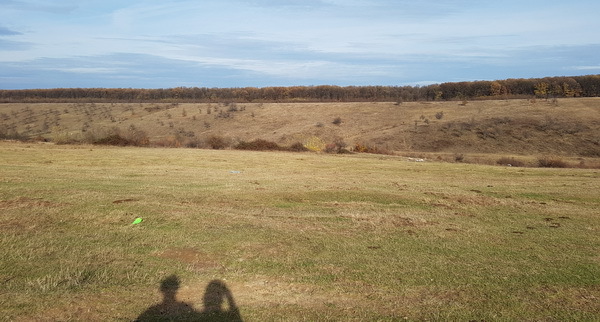 Unfortunately, it was a windy day – I should’ve stop at first wind gust, but I continued to fly. Shortly, the quad was about 150 meters far from me, heading towards the forest. At this point I lost the clue on the orientation of the aircraft. I quickly enabled headless mode trying to recover it. I still heard the noise of the motors but, I lost completely the visual contact. My wife worn me that I should land a.s.a.p, but I didn’t listen to her…. Later, this proved to cost me a good drone and a 16GB micro SD card :(. The time we realized that we can’t see the drone anymore. I started immediately the searching mission. With my phone (searching for WiFi signal) on right hand and RC on left hand, trying to arm the motors and hopping for some noise. I searched for hours a pretty large area, but with no success :(. Its fully black color didn’t helped at all. 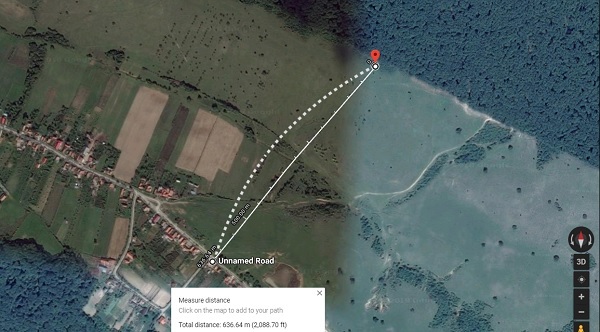 Looking on google maps, I found that the supposed crashing zone is about 600 meters from the take-off point. No way to have the control over the aircraft that far. It flew away by its own, instead of landing. As I’m kind of guy who believes that no trooper should be left behind, the same day, after it got dark, I returned to the supposed crashing zone checking for the navigation lights. I hopped that the battery still has enough power to blink the LEDs. I checked the ground as well as the trees. Besides some wild animal eyes that scared me, I didn’t find anything else 🙁 R.I.P. my Lefant Zeraxa Pro. Except for the unhappy ending, my time with the Lefant Zeraxa Pro was very pleasant. 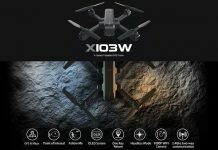 It is a very easy to control drone with lots of features. It has multiple control modes and pretty nice flying time. 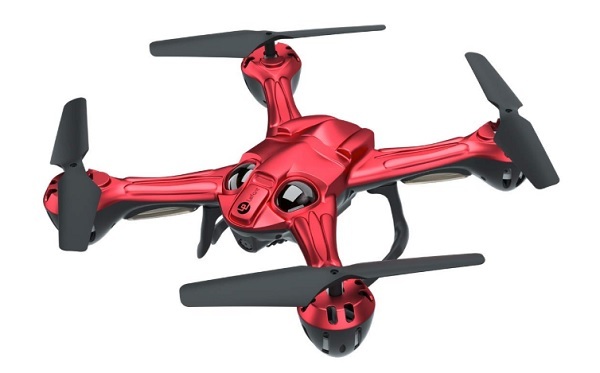 Being a non-GPS drone, I found it a bit overpriced, especially that it has brushed motors and only 720P camera. Whether you are looking for a nice Christmas gift for your kids or your own fun, this Lefant Zeraxa Pro quadcotper is an excellent option. You can find it on Amazon for $99.99. You have two color options: red and black. This “B6L33EGK” coupon code will provide you 20% off. Available on Amazon (multiple warehouse options). Motors are not stopped when out of controller’s range.